When you design a projector that is bright, feature-rich, and too big to lug very far, you can be pretty sure that it will be ceiling-mounted in many applications. If you want to make installation easy, you had better include at least vertical lens shift capability if horizontal shift is not in the budget. 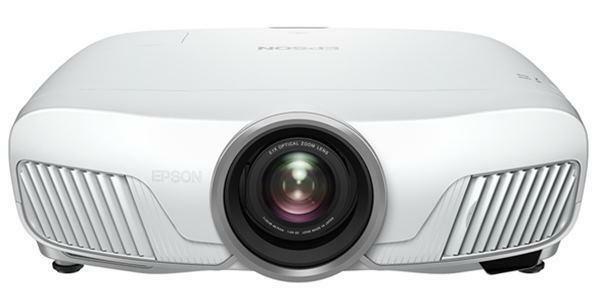 Mitsubishi has checked all the boxes with their new WD720U DLP projector. This 1280x800 projector is rated at 4,300 lumens, it has every conceivable input, and it tips the scales at nine pounds which, although not dainty, is still three pounds lighter than its nearest rival. Mitsubishi bills the WD720U as a multimedia projector, and that is a fair description. It does put up vibrant computer images, but it delivers excellent video images as well. The native 16:10 aspect ratio is terrific for large documents and multi-page spreadsheets, and it displays only tiny black bars above and below the image for a 16:9 format movie. The back panel offers every popular source connection including HDMI and two flavors of USB (Types A and B). The USB-A input allows insertion of USB flash drives containing either JPEG photos or converted Microsoft PowerPoint files for computer-free presentations. For networked installations, the WD720U offers compatibility with Crestron and AMX control protocols. In addition, both LAN and Ethernet connections are provided. For educators who need an extra measure of security, there is a security bar and a Kensington lock to discourage unplanned movements of the projector. Finally, a 10-watt mono speaker is included for those situations where external amplification may be unavailable. All in all, the WD720U is a solid performer for medium-size venues or for rooms where ambient light is a problem. Out of the box, the WD720U puts up a video image that really needs no adjustment. Colors are well saturated and flesh tones are excellent in the Theater preset mode, and highlights and shadows are nicely rendered. But when you crank up the brightness in Presentation mode, video images still look good even though their color balance is impacted a little. This means that if you happen to take the WD720U home on the weekend, you will be able to put up an excellent image even if your living room is moderately bright. Like most commercially oriented, single-chip DLP projectors, the WD720U delivers a dimmer video image than its 4,000-lumen LCD counterparts. This results from the color generation technology differences between the two projector types. This can be a noticeable difference when ambient light is not well controlled. A nice feature of the WD720U is its large heat exhaust vent. When you are generating 4300 lumens, a lot of heat needs to be evacuated from the case. Many projectors have a small vent and the fan makes a lot of noise pushing all that hot air through the vent. The WD720U's vent consumes the entire right side of the projector and results in lower fan noise than its competitors and no hot spots blowing on audience members sitting near the projector. The vertical lens shift is well designed. A pop-up cover on the top of the WD720U reveals the lens shift knob which can be rotated to raise or lower the image from its center position. The range of adjustment is not dramatic (roughly ±13% of screen height), but it should be sufficient for most installations.